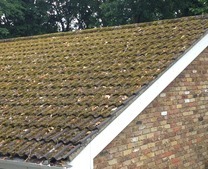 Problem: Mr Patel had seen his roof deteriorate over a period of years with a build up of dirt and moss and algae as the main issues. 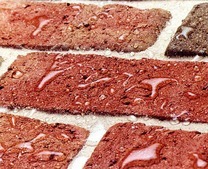 Stuart Babbs is one of our Smartseal registered installers for Climashield. 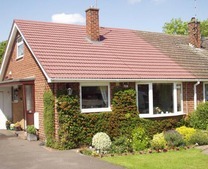 Although Stuart is based in Oxford, he was happy to provide a free no obligation quote to clean and coat the roof. 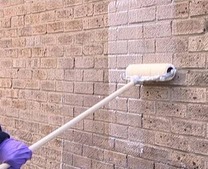 When Stuart visited Mr Patel's property he could see straight away that moss, algae as well as a layer of ingrained dirt was the big issue for Mr Patel. 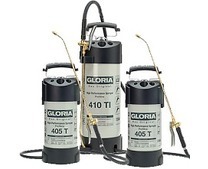 The roof was pressure washed from top to bottom and a biocide treatment was then appioed to kill of any remain spores. 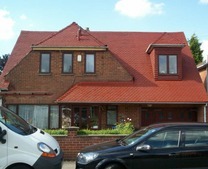 Stuart then applied a Rustic Red roof coating to totally transform the look and appearance of the roof. Mr Patel's property was a semi detached bungalow so there was no requirement for a full scaffold on this particular project. Great care was still taken to ensure all health and safety considerations were taken into account even though the roof provided easy access using roof ladders. 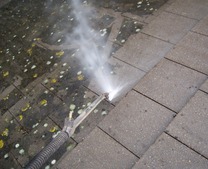 The pressure cleaning process started at the junction with the adjoining property and the area that has already been cleaned can be clearly seen in the image above. 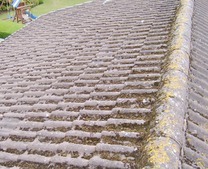 This shows the considerable amount of moss, dirt and ingrained grime that had built up over the years and why Mr Patel thought it was necessary to have his roof cleaned. The second phase was the completion of the roof cleaning process to ensure all the dirt and grime was completely off of the roof tiles. The end result was quite remarkable and Mr Patel was very pleased with the outcome. 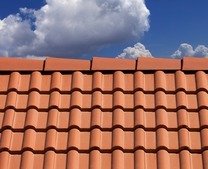 Some minor repairs were carried out at this stage which included some re-pointing of loose cement around the existing ridge tiles. 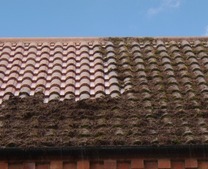 The roof was then left to dry off for a few days before the 3rd stage of the process (roof coating) could be undertaken. The final stage was to coat the roof to ensure it was fully protected against deterioration and the speedy re-growth of moss. Mr Patel liked the look of Rustic Red and this was then applied using an airless sprayer to create an even finish. 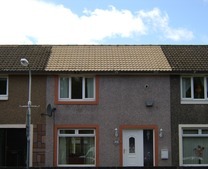 Two coats were applied and the roof looked like new on completion. Mr Patel was extremely happy with the outcome and was happy to recommend Stuart and his roof cleaning services to his immediate neighbours who were also thinking about getting the work done.